1. Patients who are in a moderate to high risk group of developing decay. This includes those undergoing radiation therapy to the head and neck and also individuals taking certain medication. These can cause a decrease in salivary flow which results in a condition called dry mouth. Saliva acts to wash away plaque and food debris: If not present, these substances will adhere to the tooth’s surface and cause decay. 2. Orthodontic Treatment: Due to the brackets, braces, wires, elastics and other paraphernalia that are involved, it is harder to keep your teeth clean. This usually translates into an accumulation of plaque and food debris and ultimately an increase in the risk of decay. 3. For children that don’t live in areas where the water is fluoridated. Exposed root surfaces are dentinal surfaces that are no longer covered up by the gums. The dentin has nerve endings that are the cause of that troublesome cold sensitivity that people frequently complain of. In addition, the dentin is ‘softer’ than the enamel and if exposed to plaque, is more susceptible to decaying. Fluoride addresses both of these issues. Handicapped individuals who can’t practice proper oral hygiene due to physical limitations. Those that presently have active decay and are very prone to getting cavities, (based on their previous caries history). Some people are just more prone to getting cavities than others. Patients who have white or brownish areas that are found mainly near the ‘necks’ of their teeth along the gum line. These discolored areas are considered to be weaker than normal tooth structure. 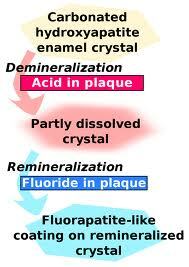 They are not the same as the ones discussed in part one (fluorosis). These are referred to as areas of Hypomineralization; areas that didn’t get enough minerals when they were forming. In the next blog we will look at what Hypomineralization is. In order to deal with the above issues, we rely on fluoride in the form of mouth rinses, gels and foams that are placed into special trays and then inserted into the mouth (please see image from the previous blog). A common regimen of fluoride treatment is to place the trays in your mouth for four minutes per day once daily…Oh and no eating or drinking for 30 minutes after. Copyright 2017 © Dr. Axel Rad & Associates. All rights reserved.